Roda Large Format up to Imperials, yup 6 Litres of some of the worlds best Tempranillo! Walking the tight rope in search of that point that sits just perfectly between the old and the new, Roda have made their mark. Roda, based in Rioja, was one of the first producers to spark my interest in Spanish reds particularly with their Tempranillo’s. At the time, back in the early 2000’s, Spanish wine was seeing the same kind of change we’ve seen happen in many old world wine regions. At one end of the spectrum, wines handled in an extremely oxidative manner, stored in oak under the rules for the D.O. for long periods of time, often resulting in oxidised volatile wines. On the other, heavy hand use of oak, clinical, technical wine making that was turning great fruit into boring cumbersome wines. Roda II, now named simply Roda, and Roda I, were two wines that managed to find the perfect balance between old school and new school, making wines of great balance and personality. Their top wine Cirsion aims to push even further, exploring precision viticulture to ensure only the best plots, with the finest of tannins end up in the bottle. Although a young winery, celebrating it’s 25th anniversary in 2012, Roda has access to an incredible selection of old vines, yielding exceptional fruit. It shows in their wines. Engaging aromas. The predominant aromas come from the vineyard: red berry fruit or black fruit but they are always present. Oak, in the background, almost imperceptible. Sweet spices and mineral notes, bringing complexity. Balsamic touches, giving freshness. The palate is where their great class shows through. Full, ample, with definition. Savoury, fresh fruit flavour, long. With sweet, softly integrated tannins. A sensation of volume and freshness. Wines that incite you to have another sip. Absolute respect for the vintage: down to the last drop of wine in each bottle, the vintage is exactly what is indicated on the label. Roda is committed to offering the best possible wine that the climatic vintage has been capable of creating in our vineyards. The complex system of different vineyard plots enables us to offer excellent wines every time. Wines that give pleasure, wines that transmit sensations. All of the wines on offer are dominantly or 100% Tempranillo with a splash of Graciano or Garnacha (Grenache) thrown in here and there. It tends to offer rich, succulent fruit with soft supple tannins. It a variety where getting élévage right is critical, too little ageing pre-bottling resulting in raw often reduced wines. No such problem for Roda or Telmo, they’re both well and truly across how to get the most of the variety. Tempranillo is grown under many names across the globe. By far the greatest plantings are in Spain, with over half a million acres planted to the variety. On of which Tinta Roriz I made Vintage Port with at Yarra Yering. It is typically grown in the Duoro ending up in Port contributing oppulent fruit, balancing the likes of Touriga Naçional and it’s structure. From the outset, Roda has been dedicated to selecting the best sites and working through disciplined R&D projects to optimise fruit quality. This approach has truly encouraged the personality of the vines to shine! Roda wines are essentially ‘vinos de viñas viejas’ (old vines wines), from vineyards 2/3 owned, and all entirely managed by Roda. In Roda’s case, old vines are determined as 35 years or more, though most are 50+. The greater depth of roots and the larger volume of soil encompassed by old vines reduces the influence of drought or excess rain, balances yield and stabilises character. Old vines set smaller, more concentrated berries with much lower juice-skin ratios and more faithfully reflect the mineral nuances of soil through mature natural tannins and acid. Of late, Roda have introduced a new wine, ‘Sela’, which is not an old vines release. When the Roda project was set up, extensive vineyard plantings were undertaken. For many years, this material planted by Roda was sold off on the bulk grape market. Nowadays, these 20yo+ plantings, while not old vines, are mature and characterful enough to warrant a release, ‘Sela’. All wines are from dry grown bush vines with three branches pruned ‘en vaso’. The vase-pruning form ventilates the plant and gives an excellent balance of light and shade for the fruit. Most of Roda’s plantings are Tempranillo, but depending on the year and the wine in question, some blending with Garnacha and or Graciano is undertaken. Mazuelo was used in earlier years. Roda’s viticulture is organic, with vineyard (design-and management) plus biological controls taking care of pests. Yields average around 30 hl/ha. Each vineyard is handpicked several times over by Roda’s own picking team. To underscore their viticultural commitment, at 550m altitude near Cubillas they maintain the Enit research vineyard of some 582 distinct cultivars of Riojan vines! This vineyard-museum was planted in 2000 after 3 years’ full time work by a team of viticultors identifying all possible distinct cultivars of Riojan wine grapes. Today we offer three of Roda’s wines across several vintages and in massive volumes up to Imperials of 6 litres. Roda formerly Roda II, Roda I and Cirsion their top wine. Unfortunately, the Cirsion is only available in 750ml. 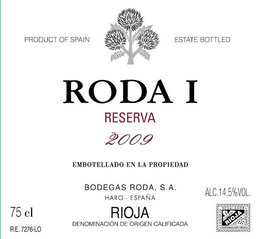 Roda, compared to Roda I, is based on a selection of Tempranillo which exhibits some red fruits and earth in the mix with the stricter, more structured blue-note Tempranillo which becomes Roda 1. Roda is a wine of great depth, tannin texture and class but in a relatively fruity and approachable register. This tendency towards open-hearted red fruit and earth is augmented with judicious blending, depending on the year, of some Garnacha and/or Graciano. 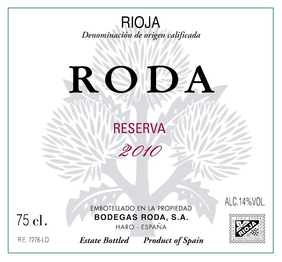 Roda is grown from vines between 35-100 years’ age, all dry grown ‘en vaso’. Hand picked, hand everything, it is fermented in open foudre, gravity decanted to age 15 months in new+1yo French barrique, then gravity-decanted again for bottling (unfiltered, unfined) and cellar ageing before release. The garnacha component of Roda’s wines comes from separate vineyards in Rioja Baja, at Tuldelilla and Alcanadre. An excellent vintage. 440 mm. rainfall during the growing season. The winter was wet, early spring was dry and there was plenty of rain during the flowering season which caused millerandage and in turn resulted in open and well-aired clusters. July and August were very dry. There was virtually no rain. There were no phytosanitary problems and almost no treatments were needed. Some light rains in September and October that allowed an excellent, although rather small harvest. It was a cooler vintage, which left its mark of freshness and elegance in the wines. Mineral, spice and hints of fresh mushroom with red fruits follow through to a full body, round and silky tannins and a long and flavorful finish. Shows reserve and class. 90% tempranillo and 10% graciano. Drink or hold. The fundamental characteristic of the 2012 vintage is to be the second consecutive year of drought. 472 mm. rainfall were collected in the months of the growing season, but 84 mm. were after the harvest, therefore the rainfall used for the harvest did not reach 400 mm. and we came from a previous year of 363 mm. The budding was late due to the cold temperatures and the scarce of water in the soil. From May the temperatures rose and the vineyard recovered the delay. It was a late harvest due to drought. As usual during the dry years the health of the grape was excellent. The self-regulation of the vine allowed that the ripening was good. There was little vegetation and low production, much lower than usual. Very fresh, deep black fruit and licorice character. Rich and complex, but also very lively for its age. The refined tannins are beautifully integrated and drive the long, complex finish. Delicious now. 100% Tempranillo. As Agustin says, “It is a wine with more structure, with deeper sensations of black fruits, greater wealth of minerals and more complexity. It is a wine for quietness and meditation with a style marked by black cherry.” Roda 1 is handled identically to Roda, but the blue-note fruit has a heightened minerality with fine but determined structure resulting from great tannin maturity. The differences between Roda and Roda 1 are simply the product of fruit selection, not winemaking. It’s a wine of power with enormous finesse. 419 mm. rainfall. Rainy winter and spring. The harvest started with good water reserves. The whole cycle was ahead of time from the start. A very hot and dry summer. Maximum temperatures between 35ºC and 37ºC. Ageing: In 50% brand new and 50% second use, French oak barrels. 16 months in barrels and 20 months cellaring in bottle. Rich and mature nose of ripe strawberries, sweet oak and hints of red flowers. Full-bodied and concentrated with a good amount of soft tannins and a fruity and sweet finish. Opaque ruby. Complex, exotically perfumed bouquet of ripe black and blue fruits, incense, vanilla and lavender, with a mineral note adding vivacity. Sappy, concentrated and focused on the palate, offering vibrant blueberry and cherry pit flavors that become sweeter and spicier with aeration. Delivers a suave blend of richness and finesse and finishes very long, with gentle tannins sneaking in late. 440 mm. rainfall during the growing season. The winter was wet, early spring was dry and there was plenty of rain during the flowering season which caused millerandage and in turn resulted in open and well-aired clusters. July and August were very dry. There was virtually no rain. There were no phytosanitary problems and almost no treatments were needed. Some light rains in September and October that allowed an excellent, although rather small harvest. Time has mellowed this ripe and rich wine leaving it silky in spite of the intensity and depth. Tannins are now polished and the finish is long and fine. Drink now. First released in 1998, Cirsion is Roda’s in-vineyard tannin selection project. 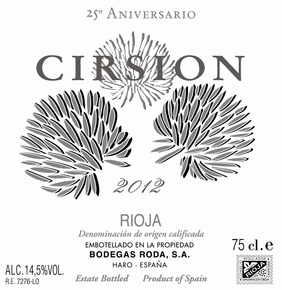 Cirsion (latin for the thistle, which is Roda’s logo) is based on a theory of tannin development in perfect old vine Tempranillo. Under exceptional conditions (not mere hyper-ripening), Roda are able to identify very small parcels which naturally exhibit ‘long-chain’ (ie ‘wine-like’) tannins in berry, rather than the more usual model of softening shorter brittle tannins with barrel and bottle maturation. This should not connote a soft-fruity-round wine, however. Cirsion is a very serious, concentrated, complex, powerful beast – but this power, extract and expression is amazingly harnessed by the full, unbelievably supple tannin structure. A ‘grand cru’ anywhere in the world. 100% Tempranillo. The budding was late due to the cold temperatures and the scarce of water in the soil. From May the temperatures rose and the vineyard recovered the delay. It was a late harvest due to drought..
As usual during the dry years the health of the grape was excellent. The self-regulation of the vine allowed that the ripening was good. There was little vegetation and low production, much lower than usual. Vineyard: Selected bunches from different plots. Applied methods from own research and development on polymerisation of tannins and anthocyanins. Fermentation: In French oak vats, with controlled temperature. Malolactic fermentation in French oak barrels. Ageing: During 8 months in 100% brand new French oak barrels. The top of the range and exclusive 2012 Cirsion is always a controversial wine, no less because of the bulky price tag. It's the prototype of voluptuous and showy modern Rioja, produced from very ripe grapes. Crision is made from only selected vines within a specific plot of very old vines. The tannins are so ripe that they reckon the polymerization of the tannins start inside each grape, and therefore the tannins are very polished and need less time in barrel. That's why the most expensive wine is always released much earlier than the other ones and we're already on the very dry 2012 harvest. The élevage is in new wood, which also makes the wine ready more quickly, but the aging period is quite short at around nine months. It's mostly Tempranillo, but in this vintage it also contains some 10% Graciano, the first time ever. The peculiarity of 2012 is that it comes after a very warm and early vintage, and there was little water in the soil, so it all started quite slowly. 2012 turned out to be an extremely dry vintage with extremely low yields. There are plenty of notes of cocoa, espresso coffee and roasted wood that might need some time integrate in the wine and give way to those aromas of damp earth, violets and small blackberries. The ripeness and style of the oak reminded me of the style of the late 1990s. The palate is ripe and lush, and it does not transmit any heat. Winemaker Agustín Santolaya reckons that the Graciano provided a special freshness that balanced the wine. Yields were low and there was little vegetation, too; it was a special year, with small amounts of quality wines. There is no Cirsion in 2013 or 2014. In 2015, it will also have a small percentage of Graciano. Analytically, it's quite low in acidity, which also makes it soft and round. 3,535 bottles produced.